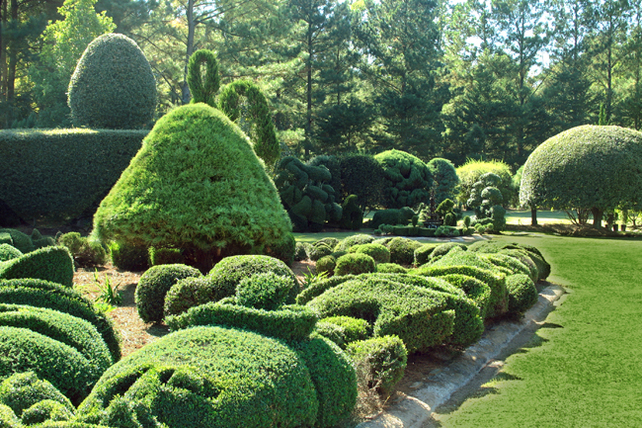 The Pearl Fryar Topiary Garden, in Bishopville, South Carolina, is a three-acre garden with a purpose. Its development is a story of plants, sculpture, community, hard work, and inspiration. Self-taught and armed with a hedge trimmer, Fryar worked for more than 20 years to create and maintain remarkable and dazzling topiaries from plants that were often salvaged from a local nursery. Pearl Fryar celebrates his 79th birthday. 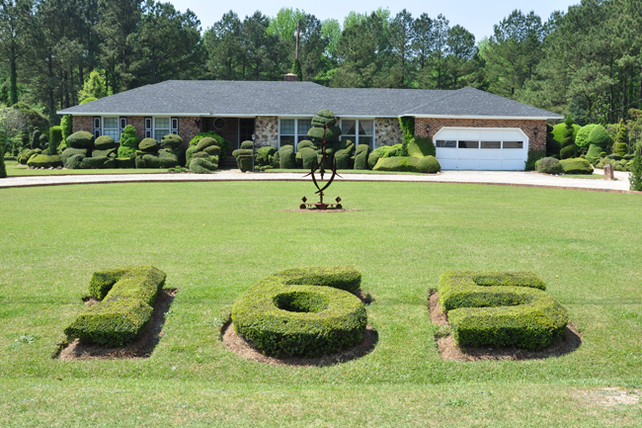 In July, Mother Nature Network features the Pearl Fryar Topiary Garden, highlighting Pearl's legacy and broaching the subject of the fate of his garden. The Pearl Fryar Topiary Garden, Inc., the 501(c)(3) entity that was intended to manage the garden after Pearl, is dissolved in September. The garden remains open to the public. Pearl Fryar receives National Garden Clubs, Inc. Award of Excellence. Pearl Fryar teaches a topiary class at Moore Farms Botanical Garden in Lake City, SC as part of the ArtFields art competition and festival, sponsored by the Lake City Creative Alliance. 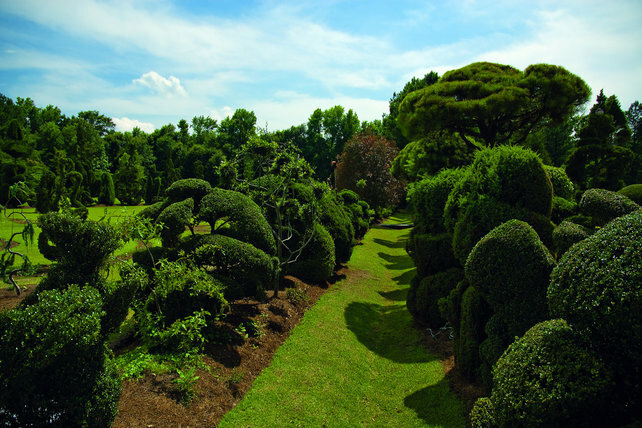 The Garden Conservancy's 25th anniversary book, Outstanding American Gardens, features the Pearl Fryar Topiary Garden as one of fifty notable gardens across the country. Pearl Fryar celebrates his 75th birthday. He is also featured on National Geographic News. Pearl Fryar receives the Elizabeth O'Neill Verner Special Award from the South Carolina Arts Commission. Fryar is in increasing demand on the lecture circuit around the country for his inspirational presentations about his garden as well as his message of developing one's own talents. Pearl is a guest speaker at NASA Langley's Diversity Day. In January, Lindsey Kerr is hired as project manager at the garden. The Martha Stewart Show features a visit to the Pearl Fryar Topiary Garden. The Pearl Fryar Topiary Garden and Longue Vue Gardens, both Garden Conservancy preservation gardens, collaborate to bring Pearl Fryar to New Orleans to give a series of presentations and talks. The Friends of Pearl Fryar Topiary Garden and the Garden Conservancy enlist Lindsey Kerr for a 12-week internship to document maintenance practices in the garden and collect and organize archival material. Pearl and his garden appear in a John Deere television commercial. A Man Named Pearl documentary wins second Audience Choice Award at the Salem Film Festival in Oregon. Several members of the Garden Conservancy Board of Directors gift Pearl with a cherry picker, allowing him to accomplish much more work in much less time. We help to create and incorporate the Friends of Pearl Fryar Topiary Garden, with the mission of supporting its eventual transition into a public institution. The Friends group later becomes the nonprofit organization Pearl Fryar Topiary Garden, Inc. The documentary film, A Man Named Pearl, wins the Crystal Heart Award at the Heartland Film Festival in Indianapolis and the Audience Choice Award at the Salem Film Festival in Oregon. Fryar receives the Winthrop University Medal of Honor for significant contribution to the arts. Fryar participates in a site-specific public sculpture exhibition in Charleston's Spoleto festival, and is featured in Art in America magazine. He has since been featured in Garden Design, Fine Gardening, and Charleston magazine. Fryar receives his first commission: The State Museum in Columbia. 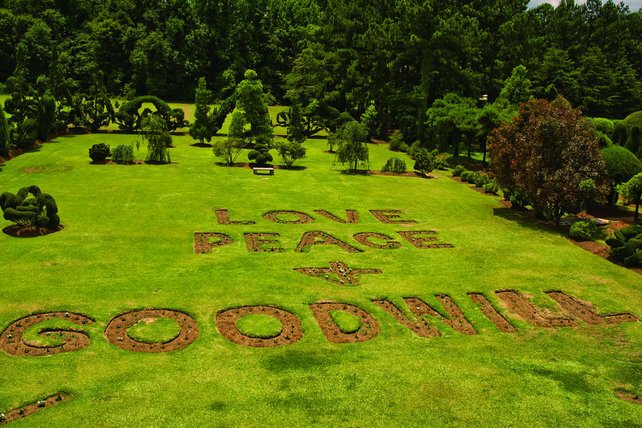 Media start featuring Fryar's plant carvings of "Love, Peace and Goodwill" and, eventually, Fryar and all of his work. The exposure draws onlookers from afar. The road to his property is expanded as a turn-around for tour buses. The garden becomes a global tourist destination. 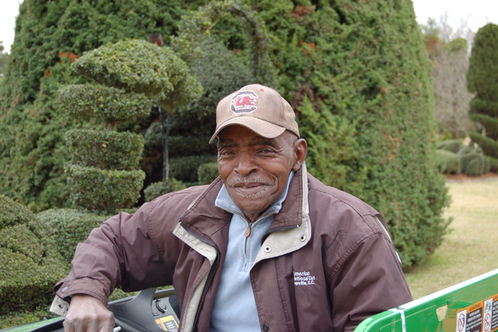 Using a gas-powered hedge trimmer and salvaged plants, Pearl Fryar begins his topiary garden on 3 acres at his home. After 12-hour shifts in his day job at a factory, this self-taught topiary artist would sometimes work through the night creating what would amount to more than 150 topiaries of extraordinary shapes and sizes. "If everyone in this country would do one thing for someone who is less fortunate than they are, then we could solve the homeless and a lot of other problems. I use what I have, my God-given talent, to make a difference in other people's lives. I cut up bushes." "IT WASN'T IMPORTANT TO ME TO CREATE A GARDEN. I WANTED TO CREATE A FEELING, SO THAT WHEN YOU WALK THROUGH HERE YOU FEEL DIFFERENT THAN WHEN YOU CAME."